Get the knowledge you need to get the job you want. Jobs that require STEM skills and training currently comprise 20 percent of all jobs in the U.S. economy. 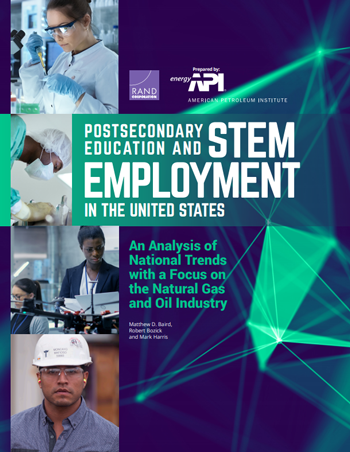 Current projections anticipate that the STEM economy will grow about 9 percent between 2014 and 2024—faster than the growth rate projected for all other occupations. Because STEM competencies at every education level are critical to natural gas and oil jobs, the industry has a great interest in better understanding and promoting the relationship between STEM education and employment. In fact, earning a STEM bachelor’s degree almost doubles your likelihood of working in the natural gas and oil industry. STEM jobs also pay significantly more than non-STEM jobs: individuals who work in a STEM occupation make approximately $64,000 per year compared to an annual wage of $47,300 for those not in a STEM occupation. When you take those skills into the natural gas and oil industry you make even more. Almost without exception, across all education levels, degree majors, gender and race/ethnicity groups, and occupation types, those who work in the natural gas and oil industry earn more than those who do not.